This amazing home is nestled in one of five exclusive gated sections in Rancho Gabriela, and rests at the end of a cul-de-sac with plenty of mature trees & privacy. As you approach your new home, there is a huge driveway extending from a rare 4 car garage, which has a 4 foot extension in the middle. There is no shortage of parking space! As you approach a huge grand entrance you will enter through an 8 foot tall door and into soaring 20 foot vaulted ceilings and roomy formal living and formal dining area. Continue into an open concept kitchen and family room area with gas range/oven, plenty of tall cabinets, storage space and a wet bar. Downstairs master bedroom and bath is spacious with a large bay window, separate garden tub/shower, double sinks and huge walk in closet. Large laundry room with free standing laundry tub. Upstairs has tons of space with 5 large bedrooms, one of which is a second smaller master bedroom with its own private bath and walk in closet. (HOME HAS 2 MASTER BEDROOMS!) There are TWO loft areas too, one of them is large enough to accommodate an air hockey, ping pong, or a pool table! Exit from the large loft upstairs onto your own private COVERED DECK with amazing views of the Estrella Mountains. Finally......the yard! You want space, you got it! From the kitchen downstairs, you will exit the home onto a huge covered patio and into the spacious backyard with plenty of mature trees to enjoy. Play pool has waterfall feature, in floor cleaning system, and pole sleeves in ground that can accommodate a volleyball net and/or umbrellas. There is even a putting green, seating area, and two fire pit areas to enjoy on those rare chilly nights. Best of all, this home site has abundant space that can easily accommodate an RV garage!! A few neighbors have already added them to their own property. Home site currently has a double gate on property to accommodate any outdoor toys and recreational vehicles, as long as they sit BELOW the fence line. 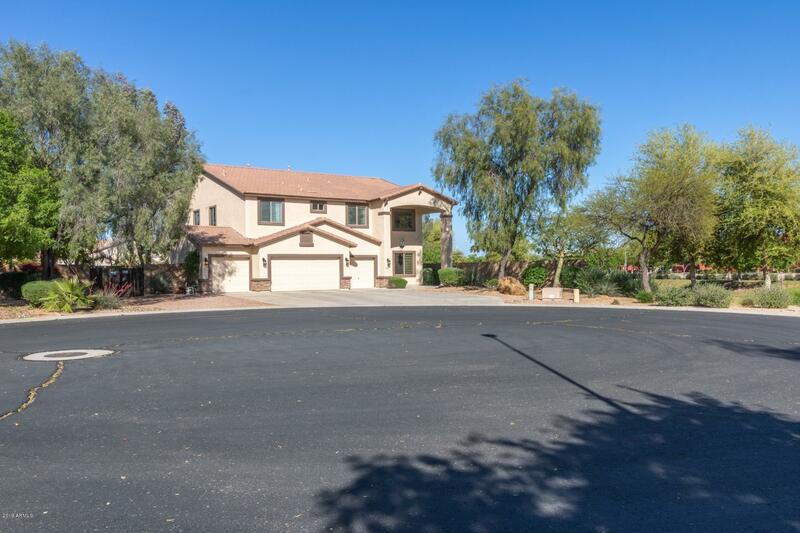 (An RV garage would be required to store anything larger or taller and need HOA approval) Don't miss this rare opportunity to own this amazing home all all it has to offer!! (Shown by appointment only with Buyer pre-qualification) Additional features: Security system, 2X6 construction, pest tubes built into walls, new pool filter, new alarm system, new paint inside and out, built in closet systems in some bedrooms, 42" upper cabinets in kitchen, dog door off kitchen into a separate gated side yard, whole house Network with Ethernet, new dishwasher, transferable home warranty, gated community with private streets.